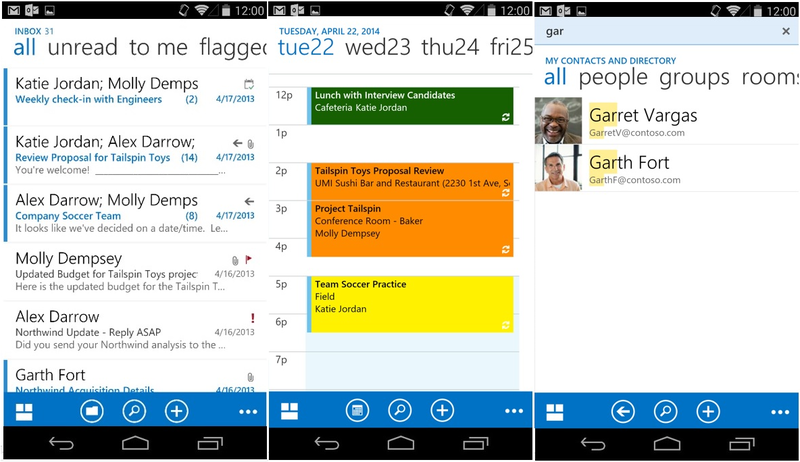 Microsoft today launched a pre-release of its Outlook Web App (OWA) for Google’s Android operating system. You can download the beta now from Google Play, if you meet the requirements. Your mailbox is running on Office 365 for business (doesn’t include Office 365 personal, Office 365 Home, or Outlook.com). Your device size is considered “small” or “normal” by Android OS (translation: no phablet or tablet support just yet). Microsoft says the pre-release is to gather feedback, fix bugs, and generally make sure the app is ready for prime time. Only a few devices can use it now, with more being added “regularly”; in fact, you can vote to have your device added on OWA for devices. The company is promising that the pre-release for Android lets you do everything you can already do on OWA for iPhone. The main thing it does differently is contact syncing: you can update contacts directly from the device’s address book and the app will make sure the changes apply to your Office 365 mailbox as well. Yet the company hasn’t said anything in regards to OWA for Android tablets. Nevertheless, Microsoft is clearly attempting to bring a native Outlook Web App experience to Android devices without actually writing an app from scratch. While this should make it easier to keep the apps updated with the latest features and improvements, since much of the code will remain the same, right now it looks like the Android version has a very long road ahead of it. We’ll keep you posted as development progresses.